After a year considering the idea, the Mozilla Foundation has now decided to accept Bitcoin donations. The announcement was made today by the open-source development community responsible for the popular Firefox web browser, which created a new webpage where users can donate cryptocurrency. The non-profit organization teamed up with Coinbase in order to accept the digital donations. In a blog post, the California-based cryptocurrency company guaranteed it won’t charge fees when processing the contributions. Coinbase waives all fees for all non-profits, so 100% of donations will always go to Mozilla. We are thrilled to bring bitcoin to Mozilla and help the organization continue to create a better Internet for people across the globe. The decision is not totally unexpected. 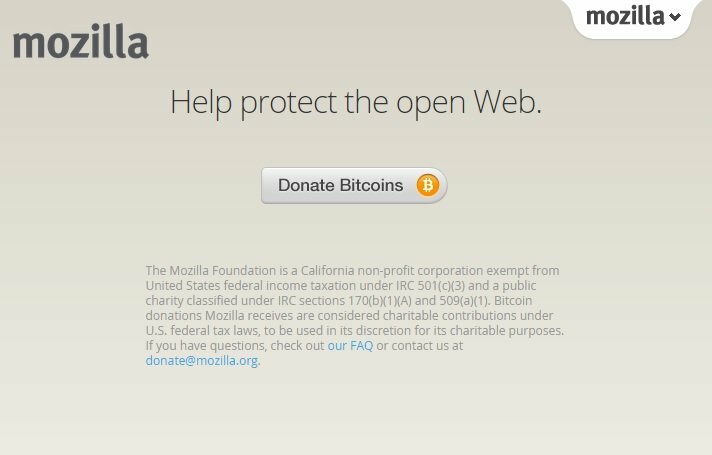 In 2013, the site Coindesk reported that the organization, which provides support to Mozilla’s open-source development projects, was thinking about possibly accepting Bitcoin donations in a near future. However, the idea never saw the light of day until now. Mozilla’s vice president, Geoffrey MacDougall, reveals the reason for the delay: “We’re a large organization and it takes us a while to move things through legal, privacy and security review. There were a lot of steps to getting this in place, but we got it done”. The announcement was also made following a post published on Bitcoin’s subReddit. The post asked why the Mozilla Foundation was taking so long to accept BTC donations after starting a dialogue with Reddit users several months before. Almost like “a crazy coincidence”, the foundation decided to start accepting Bitcoin soon after. Still, Mozilla is not accepting cryptocurrency directly on its official website. The organization has created a separate online page to gather digital donations but, according to Coindesk, a few users have reported difficulties accessing the page so far.